Well, here are the caterpillars! Our caterpillars have numbers on each little part - numbers $1, 2, 3, 4, \ldots$ up to $16$. You can see their pale blue head, and their body bending at right angles so that each part is lying in a square. When you've discovered many new ones, with the shapes - and therefore the numbers - all showing differently, you could compare them. What is the same and what is different? Can you explain why? You could try to put the caterpillars in shapes that are not squares! 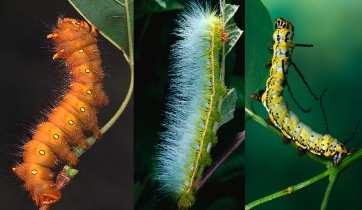 a) Choose one of the caterpillars and, using the numbers and the way that they are arranged, explore the patterns and relationships you can find. b) Then let that caterpillar grow nine more parts so that it becomes a $25$ caterpillar with the shape bending in just the same way. Explore those patterns and relations. c) Finally, compare the two different groups of things you've discovered in a) and in b). Do tell us about all the things you find out. Patterned numbers. Investigations. Comparing and Ordering numbers. Practical Activity. Addition & subtraction. Combinations. Games. Multiplication & division. Working systematically. Trial and improvement.